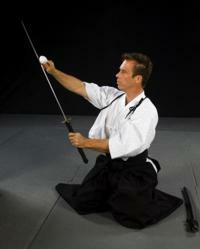 I’m Shihan Dana Abbott and my expertise is in Kenjutsu where I have earned the rank of Shihan 7th Degree Black Belt. 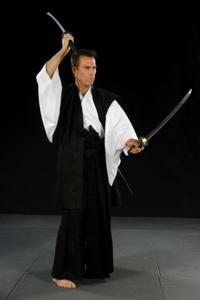 I teach Tachi-iai: Toyama-Ryu Iai Batto Do Japanese Swordsmanship. I became interested and involved with the sword 38-years ago when I was attending ASU. It was something that was always a mystery and held a great deal of intrigue for me. I searched to no avail to find a qualified instructor from whom I could relate and learn from. A few years after graduating in 1978, I found that I still had the drive to truly pursue this dream of mine. Consequently, I quit my job, sold everything that could not be put into a box and went to Japan where the masters and the best schools are located. If I was ever going to find an exceptional teacher this was certainly going to be the place. With focused determination and being in the right place at the right time I enrolled in Nihon Taiiku Diagaku, Tokyo’s esteemed martial arts university. I learned kendo/ iaido / kenjutsu and learned it well. These old school masters from the Showa era were extremely diligent in their teachings. For 14 years I ate, slept and lived my studies. 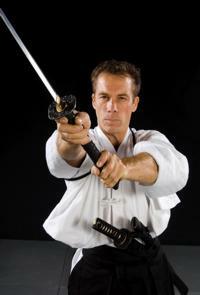 All my training and certification is through the Japanese Department of Education and Recreation where everyone receives a fair and equal chance of learning Japanese swordsmanship. During my career I have written and published five books, designed a US Patent and created a complete new niche in the martial arts industry. I have conducted seminars in over 30 countries and hold the esteemed rank of Shihan, seventh degree black belt obtained at the Hombu dojo in Yokohama, Japan. Below are honors and awards I have received over the past ten years. At the beginning of the Meji restoration the ancient “Way of the Samurai” and mindset was changing into a modern Japanese military. This attracted many provincial samurai who came to Tokyo to serve. These soldiers incorporated many of their ancestors’ koryu techniques into their swordsmanship. These ancient techniques were solid but proved difficult to standardize for a modern military. To standardize a modern military circa 1875 the military university, Rikugun Toyama Gakku, was established in Shinjuku, Tokyo by Lieutenant General Uzawa who was also chancellor. He wrote the famous Japanese military sword manual depicting 5 basic forms in (Gunto no Souhou). To break down the name, “gun” means military, “to” means sword, “sou” means control, and “hou” means rule or law was first published to homogenize various Koryu (ancient) techniques into a Gendai (modern) version to create a simple and efficient sword system that can be used everywhere, by everyone, in every situation. At the beginning of the Showa era, Tabata Shigeyoshi was called upon to administer and redesign the training system adding new forms to the originals. Tabata Shigeyoshi was the overseer of this system from 1925 until the end of WW2. Note: In 1925 the name Gunto no Souhou was changed to Toyama-Ryu due to the harsh meaning of the original name. After WW2, Nakamura Taizaburo was asked to start teaching swordsmanship again by his superior, Tabata Shigeyoshi, at a time when it was illegal to practice a military sword discipline. Over the next 4 decades Nakamura Taizaburo’s swordsmanship helped promote Toyama-Ryu into an internationally known and practiced sword system. Nakamura Taizaburo was knighted by the Emperor of Japan. Tanabe Tetsundo (my direct teacher) was the Secretary for the All Japan Ju-kendo Federation, founded by General Imamura in 1955. He became a student of Nakamura Taizaburo who was practicing Toyama-Ryu under the auspices of the All Japan Ju-kendo Federation. Tanabe Tetsundo was instrumental for getting Toyama-Ryu out in the public eye through all the books he wrote with Nakamura sensei. He also established the All Japan Goshindo Federation in 1969.